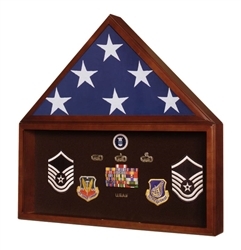 Flag cases are the perfect way to honor a departed military veteran. 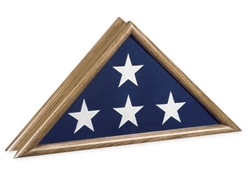 Upon the death of any honorably discharged veteran, an American burial flag is presented to the surviving family member(s). 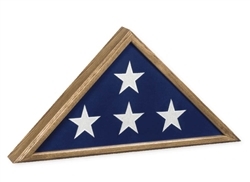 This flag is traditionally folded in the shape of a triangle which makes for easy presentation in a memorial flag case. An extraordinary amount of quality goes into the making of burial flag case purchased from us. First, hand selection of solid wood pieces that make up the flag case are chosen for their beauty and strength characteristics. Then they are carefully matched and assemble according to flag case plans using tried and true wood making techniques by skilled craftsmen for a finished product that is truly magnificent. American made quality for your beloved family member. There are several accessories for American flag cases. Stands and pedestals designed to elevate and proudly display a burial flag display case are available in several sizes and styles. Many of them are made in the same wood as the flag case your purchase to ensure a matching set. 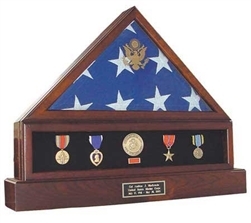 Among the flag case pedestals we carry, one doubles as a cremation urn and holds the cremated ashes of your loved one. Another pedestal can also display military ribbons and medals received by the veteran. 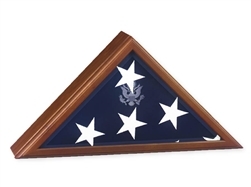 When purchasing a flag case it doesn’t necessarily have to be for a departed military veteran. Often they are purchased along with a flag as a corporate gift to clients or just as a gift to a friend or family member. You may want to make certain that the flag case you are purchasing is made in America as our flag cases are. Learn proper etiquette for handling the U.S. flag as well as additional resources pertaining to flag etiquette. Here is an article that not only has step by step instructions, but also pictures to show you how to fold an American Burial Flag. 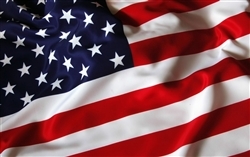 Who is Entitled to A U.S. Burial Flag? Surprisingly enough, not every person who has served in the U.S. Armed Forces is entitled to a burial flag. Read this article to learn what qualifications are necessary to receive the flag and what excludes servicemen. My Flag case was delivered very fast. The quality and depth of color of the case is excellent. Very good workmanship. I am very pleased to keep on display. I replaced first (wrong) flag case without issue. I had ordered wrong case. I was very pleased with the quick service and quality of the flag case. We ordered the Flag case and stand. It was exactly what we expected and looks great. It is a fine memorial for a WWII hero. 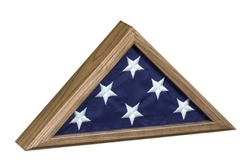 My husband and I ordered the flag case to protect the flag that was draped over his father's casket (a WWII Veteran). We are very pleased with the quality and how beautifully this special flag is now displayed. The name plaque is also very well done and adds a touch of class. The quality of your service was excellent, too. We were astonished at how quickly the flag case arrived, especially since it was personalized. Thank you! Great information on the website as well as pictures of what you are buying. Very prompt shipping of the burial flag case that was carefully packaged. Thank you. I was very pleased with the quality, price and quick delivery of the flag display case. Great service. Before I ordered, I called to ask a few questions and was very pleased with how helpful and respectful the person was that I talked to. I was also pleased in how fast my flag case order was processed and shipped. I would definitely recommend Everlife Memorials to my family and friends! I purchased a flag case for a military folded funeral flag to give to my brother as a gift. The case came in perfect condition, engraved with our father's name. I also was very pleased with how quickly the order was completed. The case was entirely as advertised. It is beautifully finished walnut and extremely easy to place the flag in for display. It is truely a proper display for the flag honoring a deceased service member. I ordered the flag case with base and engraved name plate. I received them in a timely manner and they were exactly what I was expecting when I ordered them. The quality of the products is excellent and it makes a wonderful memorial to my husband. Thank you for your excellent service.